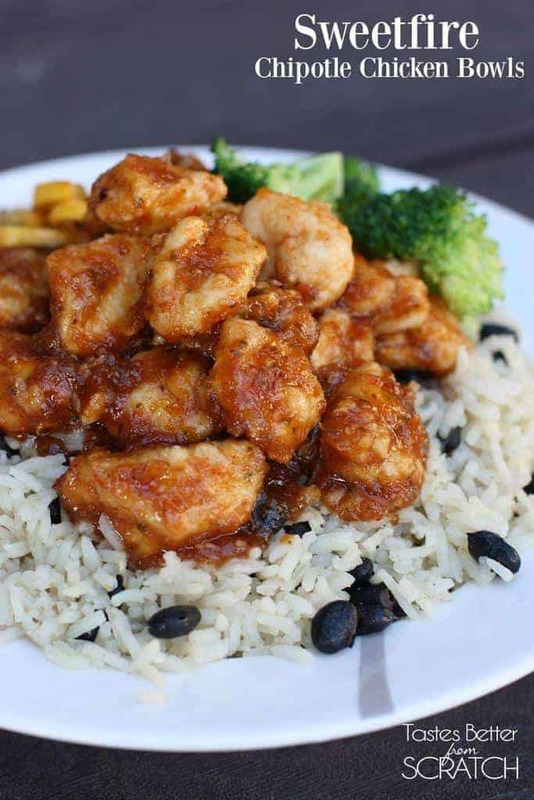 Sweetfire Chipotle Chicken Bowls are egg wash coated chicken covered in a sweet and spicy chipotle sauce served over cilantro lime rice. Guys, I go crazy for any recipes with chipotle chilies in them. There’s something about that smokey, spicy flavor that I seriously can’t get enough of!! If you’re familiar with chipotle peppers in adobo sauce you know they come in a can (usually in the Mexican food aisle at your grocery store) and you never use the whole can. A great trick it to FREEZE them! Pour the extra sauce and peppers into a ziplock bag and freeze them until you want to use them in another recipe. These Sweetfire Chipotle Chicken Bowls knocked my socks off (in the best possible way 🙂 )! I adapted the recipe from Jen over at Carlsbad Cravings and I completely loved it! 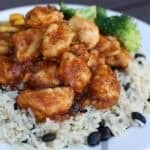 Crispy baked chicken tossed in a sweet/tangy/spicy sauce and served over my favorite cilantro lime rice and blacks beans. I also served this with fresh grilled zucchini and yellow squash and fresh steamed broccoli–those sides totally made this dish for me. Everything tasted amazing! Spray a wire cooling rack with non stick cooking spray and place on top of a baking sheet lined with aluminum foil. Place the egg in a shallow bowl and whisk well. Combine the remaining dry ingredients in a large ziplock bag. Dip the chicken pieces in the egg, and then add to the bag with the flour mixture and shake well to coat evenly. Place chicken in a single layer on the prepared wire rack. Bake at 375 degrees F for about 10 minutes or until chicken is just barely cooked through. Turn the oven to HIGH broil, and place the tray of chicken on the top rack of the oven for 2-3 minutes, or until lightly browned. Remove from oven and place chicken in a bowl. Pour pureed sauce into a saucepan over medium high heat and cook, stirring constantly, until thicken slightly (about 5 minutes total). Pour sauce over chicken and gently toss to coat. 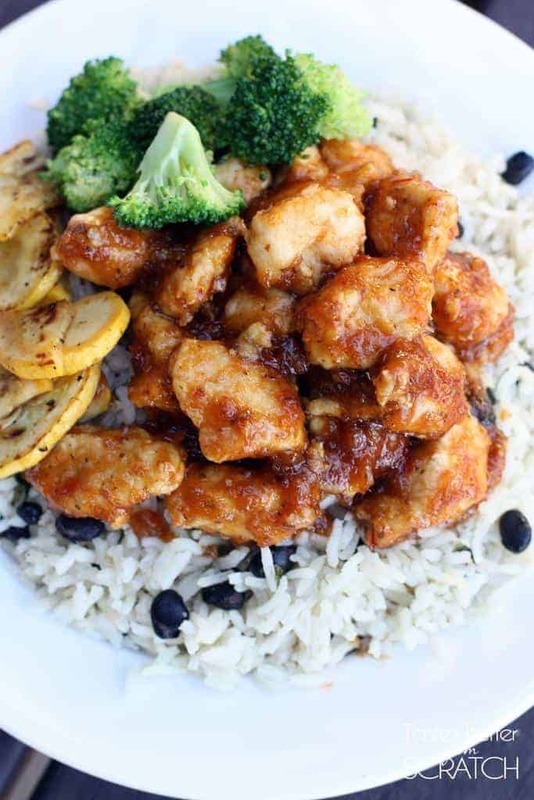 Serve with sauted yellow squash or zucchini and steamed broccoli, over rice. Pinning this immediately !! I’ve always, always, always been afraid of fresh chilies – I’m gonna have to learn to get over it! !